Gaining a design engineering position with Google is (or at least was) notoriously difficult because of some of the tests that are administered - depending on the hoped-for job. Skills in logic, creativity, problem solving, and fundamental mathematics and science are among the capabilities that must be demonstrated. 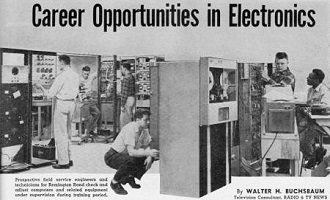 IBM was known to have tough entry requirements for customer field service representatives back in the early days of computers - for technicians as well as for engineers. "A man who can think his way through a problem can learn electronics, but a person lacking in analytic abilities will never be a good service engineer," said an employment manager. Successful candidates could expect to earn $400/month or more. That was in 1957 dollars, which is $3,400 ($41k/year) in 2014 dollars (per BLS inflation calculator) - not too awful. Field-experienced, well-qualified service engineers earned $500 to $750 per month ($4.2k to $6.4k per month, or $50k to $77k per year). Schooling for trainees includes classroom instruction using actual computers. ElectroData equipment is in use here. Careers for non-engineers in a growing industry: qualifications, background, training, and tests. While Ph.D.s, physicists, and specially trained design engineers are necessary to develop today's electronic computers, a degree is not necessary to land a job as a field engineer. As a matter of fact, a technical degree is not only unnecessary but is a positive handicap in qualifying for most of these service engineering jobs. Employers do not want design engineers or research scientists to maintain equipment. 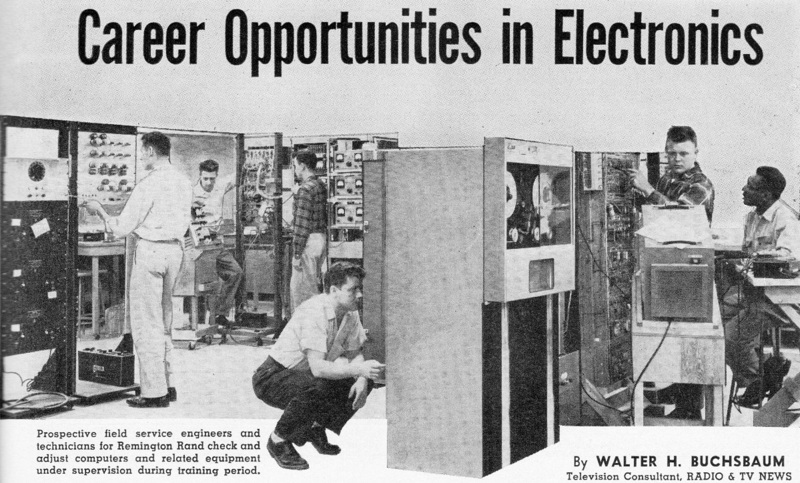 What the computer industry does want is men with a background of electronics experience who are interested in becoming field engineers to maintain the fantastic electronic data-processing machines about which we hear so much. Here is a prime opportunity for the man who has made electronics his career, but who has felt handicapped by his lack of a college degree. You say you know nothing about computers? That's all right - if you can qualify there are companies that will give you extensive training and pay you both a good salary and living expenses while you're learning! Such employment offers sound good but are even more impressive when related to the growing importance of the computer field. The use of these machines, many believe, will begin the second industrial revolution. The first industrial revolution freed man from backbreaking labor by substituting power machinery; the second will free man from mental drudgery through the use of electronic computers. These are not philosophical or theoretical statements, but a description of a future which is already upon us. A computer can read or write 15,000 or more characters per second; in the same time a typist makes about 8 characters. 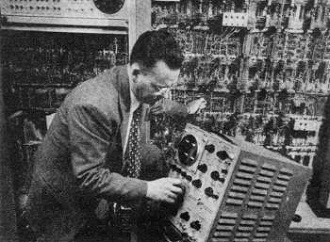 Electronic circuits add 10,000 times in a fleeting second while a girl with a comptometer is trying to enter one number. These capabilities have begun to change all aspects of our business world, the way we control manufacturing, and even our ideas about national defense. Already over 200 million-dollar computers are in use. 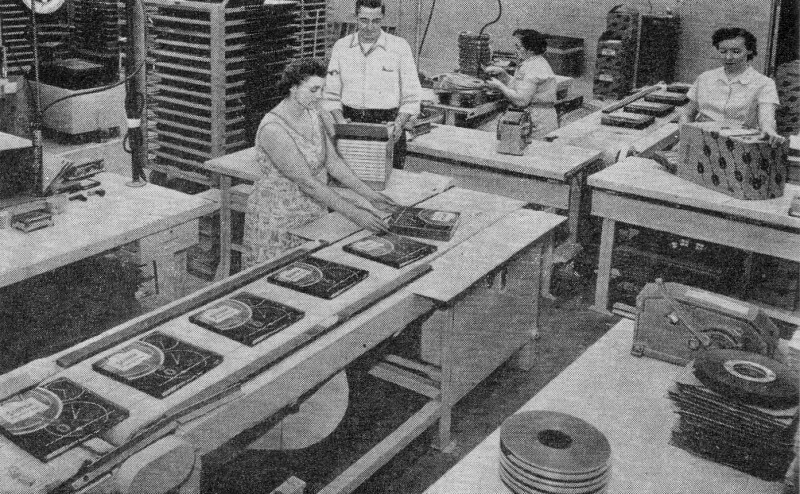 By 1966 it is estimated that 10,000 large-scale machines will be in use plus many more smaller systems. The men who must be trained to keep these computers running will number tens of thousands. It is this characteristic of explosively rapid growth in the computer business which makes today's job opportunities so challenging. The man who is a trainee today is a full-fledged service engineer tomorrow, and, if he is competent, soon a supervisor. The rate of growth within computer companies demands advancing good men as rapidly as possible. A customer engineer, working for IBM, checks out a pair of magnetic drums that are capable of storing 80,000 digits. Look at ElectroData as just one example of company growth. 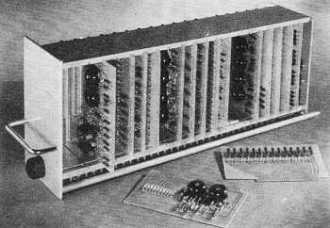 In November, 1952, Consolidated Electrodynamics Corporation set up a computer division which later became a separate corporation. In two years, the number of employees grew from 30 to 300. Today ElectroData is a division of Burroughs and has 1800 employees, of whom 445 are in the field engineering organization. While ElectroData is cited to convey some impression of the growth in this field, it is by no means an isolated case. Other giants in computers include International Business Machines and Sperry Rand. The latter is the originator of "Univac," probably the computer best-known to the man in the street. In addition to these, many other companies are actively engaged in computer operations. One of the biggest hiring programs is being conducted by "Project SAGE," which is an important part of America's air defense. Gigantic "SAGE" computers will ring the country and compare radar data with available air-traffic information to guard our frontiers against surprise attack. IBM has a contract to maintain these "SAGE" computers, each of which requires 15 service engineers per shift and operates around the clock. Qualifications for these jobs are essentially the same as for customer engineers on IBM's standard line of computers. What are employers looking for when they hire service engineers? The most important factor is not electronic knowledge or technical background. Instead, appearance and personality are the first consideration. A survey indicates that 65% to 75% of all applicants are rejected for this single reason. (See "The Men We Hire," page 77.) All companies consider the service engineer first as a company representative and second as an electronics man. Employers agree that the second requirement is the ability to think. Localizing trouble in a machine with several hundred tubes or transistors, thousands of crystal diodes, miles of wire, and innumerable resistors and capacitors is obviously a major problem. All the circuit knowledge in the world is of no avail unless the engineer can logically analyze his problem. 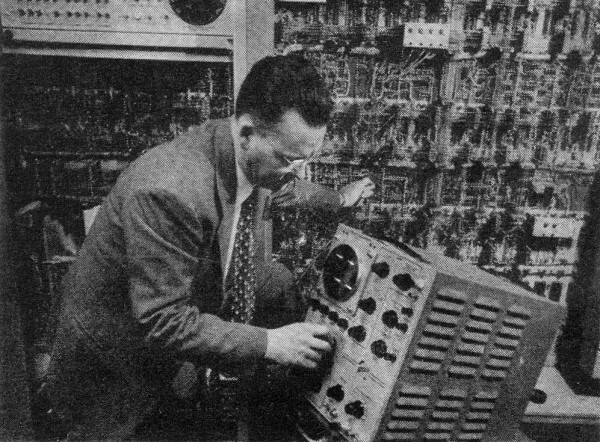 Hunt-and-try methods, experimentally changing tubes, and similar radio repair techniques plainly fail in the face of the sheer size of the computing monster. The third requirement is circuit knowledge and experience in dealing with electronic equipment. Some companies place great emphasis on mechanical ability. 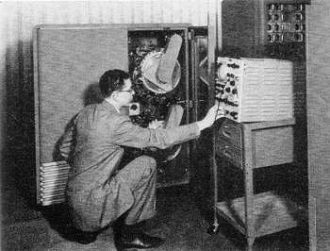 A computer is more than electronic circuits; there are card readers, tape punches, high-speed printers, magnetic tape units, and other mechanical contrivances. These peripheral devices may be supplied by one manufacturer for many systems, even though the computer often belongs to another manufacturer. Service engineers with both an electronic background and an aptitude for mechanical equipment are harder to find than circuit men. As to age, employers say, "We prefer trainees between 19 and 32 years old." Computers use the latest components and assembly tech­niques. This is a modular "building block," used in the Model 112 computer systems manufac­tured by Beckman Instruments for the chemical and pe­troleum industries. Most trainees have had some experience in radio and TV. 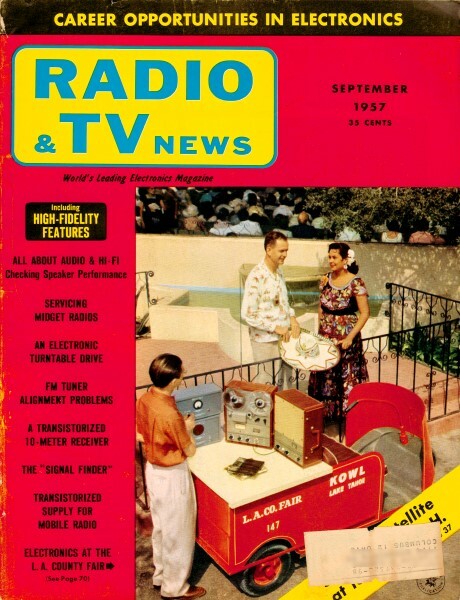 Practically speaking, radio is of little value: the tuned circuits in the r.f. section and the linear circuits in the audio amplifier do not have counterparts in a computer. TV experience is better, primarily because of the sync circuits involved. The greatest advantage is knowledge of test equipment, circuit components, and general experience in dealing with electronic hardware. Companies are willing to hire service engineers whose sole electronic experience has been in the TV and radio fields - if their other qualifications are acceptable. The majority of trainees are hired from one of two sources: ex-servicemen with military training in electronics or graduates of two-year accredited trade schools. One or two years of college is considered desirable by most employers, but, as one manager pointed out, "College experience is considered as valuable for broadening a man's personality as for the technical education." Don't get the idea, however, that employers are not concerned about technical competence at all. Most give applicants tests to check their knowledge of electricity, electronics, and, in IBM's case, mechanics also. All of the questions could be answered by a first-year college man studying physics and electronics, or by someone who has studied the subjects in a technical institute or has equivalent background. Some typical questions may be helpful to the prospective applicant. In one example, the series-parallel resistor network shown in Fig. 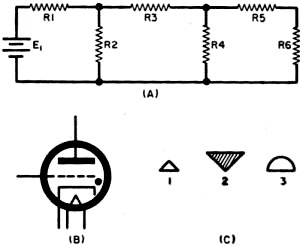 1A is given, and values are given for E1 and R1 through R6, The applicant is then asked to give the voltage drop across R6 and the value of the current through it. In another example, the applicant is asked to identify the tube type represented in Fig. 1B. Fig. 1. Job applicant tests involve these drawings, referred to in text. In addition to the technical test, most employers give a quiz in logic or reasoning. Not correlated to previous training, this tests the applicant's ability to think his way through unfamiliar problems. He may be confronted with three figures such as those shown in Fig. 1C. He is then asked to draw a figure related to object "3" in the same way as object "2" is related to object "1." In another example, he is presented with the following sequence of numbers: 16, 17, 14, 15, 12. He may then be presented with the following statement and question: "Reading from left to right, this series of numbers is constructed according to some rule. What are the next two numbers in the series ?" Much more importance is attached to the logical tests than to the technical exams. A man who can think his way through a problem can learn electronics, but a person lacking in analytic abilities will never be a good service engineer. The employment manager of one company says, "One applicant in five passes our electronics test, but only one in twenty passes both quizzes!" If you are a successful applicant for a maintenance engineering job, your new employer will put you through an extensive educational program that may last from 4 to 9 months. Instructors are excellent and the latest teaching aids are used. This education would cost an individual thousands of dollars if he had to pay for it himself. Companies estimate that a trained man, ready to accept responsibilities in the field, has cost them $5000 to $12,000 upon completion of the education program. In addition to this training, most companies pay per diem living expenses as well as salary during the training period. The first thing the trainee must learn is the overall organization of the electronic computer and how it operates. The "how" involves the "commands," or the programming instructions, which control the machine operations. Put in another way, the trainee must learn to speak the computer's language. Once programming of the machine is mastered, the next step is to understand the circuitry which translates a program instruction into a series of coded, timed pulses which generate the required action within the machine. Since computers are essentially pulse-controlled devices, the kinds of circuits which are studied include pulse generators, wave-shaping circuits, triggers, flip-flops, and electronic gates. A field engineer uses a scope to study pulses in a Datatron computer, made by the ElectroData Division of Burroughs. The most difficult part of the educational program is learning the logics of the machine. Instead of a circuit diagram showing tubes, resistors, transformers, and the like, the computer engineer works with logical diagrams which show the functional parts of the machine as symbols representing gates, inverters, flip-flops, and others. A subject which is new to most trainees is Boolean algebra, which is a mathematics of logic. This technique permits expressing the logical, functional operations of the computer in terms of equations. Once learned, the Boolean technique is a superior method of analyzing machine troubles. Not all companies, however, use Boolean algebra for service engineering. Once training is completed, engineers are assigned responsibility for maintaining equipment in the field. Typically, several engineers report to a working supervisor. When new systems are delivered to customers, there is the big job of connecting all of the subassemblies, checking out all operations, and, finally, turning over the machine to the customer. The more usual job is the day-to-day operations necessary to guarantee an efficiently running machine. About 1 hour during or before a shift will be spent on preventive maintenance, which involves making marginal checks by varying voltages and other circuit parameters and by running "diagnostic" routines, which are programs that logically check all of the different machine functions and print out results that expose the malfunction of any part of the machine. The rest of the working day is devoted to aligning, adjusting, and performing other maintenance functions on peripheral equipment which can be released from the main computer operation, overhauling plug-in components which have failed and been removed, doing advanced computer study, developing new analytic techniques, and maintaining operational reports. Of course, the service engineer really goes to work when the machine breaks down unexpectedly. Something within the computer fails - checking circuits or the machine program automatically find the error, recovery procedures fail to correct the difficulty, and the machine stops, with a glowing red light on the console which shouts trouble! Operating personnel stand about with folded hands, scheduled work is delayed, and money is going down the drain at a rate of hundreds of dollars per hour. This is the time when the service engineer really earns his money. His ability to find the trouble and put the machine back in business determines the over-all efficiency of an installation and the satisfaction of the customer with the equipment. What is claimed to be the world's largest magnetic tape plant has been put into 24-hour-a-day production by the Minnesota Mining and Manufacturing Co. in St. Paul, Minn. Built and maintained almost like a hospital in order to achieve near-sterile conditions required for producing magnetic tape for such critical applications as video tape recording, electronic computers and instrumentation recording, the plant incorporates many unusual production line features. Shown in the photo is the isolated packaging area where 10½" reels of "Scotch" brand tape are packaged and demagnetized by a continuous belt. Under the table is an electromagnet for bulk-erasing to provide tape signal free for most critical applications. The better the preventive maintenance, the fewer unexpected breakdowns will occur. Obviously, the service engineer plays a very important part in computer operations. We asked many supervisors the question, "How long does a man have to work in the field to become a truly competent, well-rounded service engineer?" There was general agreement on the answer: "Two or three years, in most cases." Finally-what about pay? Field engineering jobs are salaried positions. While there are variances among companies, trainees are usually hired at $325 to $450 per month. Some employers are more liberal than others in recognizing previous experience in establishing a flexible starting salary. After training, $400 to $500 is a typical bracket of salaries paid. For field-experienced, well-qualified service engineers the range is $500 to $750. Supervisory and administrative salaries go to $1000 per month. Fringe benefits include overtime pay, insurance plans, retirement funds, paid vacations, and military-leave arrangements. Advancement within the company is stressed by all employers, and the door is open to management, sales, design engineering, and manufacturing positions to those who prove their abilities and have interest in these areas. In this day of engineering shortages, there are employment opportunities that pay more for starting jobs. However, if you are looking to the future, today's needs in the computer industry present a rare chance to improve your electronic knowledge and get in on the ground floor of a skyrocketing new industry.